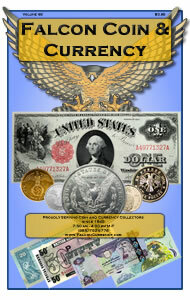 Collectors: get our latest Falcon Coin and Currency Company catalog absolutely free! It covers US & Worldwide Coins, Banknotes, Collecting Supplies including albums and tools, special offers, and valuable collector information. Collecting currency has never been easier.